Everyone has run into a webpage where the font size is unbearably small on an iOS device, typically a reverse pinch gesture will make the text legible but on some pages that have a fixed width you then have to scroll sideways in addition to up and down. You can sort of get around that font size limitation by using the Reader feature on an iPhone or iPad, but that’s not ideal for every website either. This is precisely what two handy bookmarklets aim to resolve, by creating two fontsize increase and decrease buttons that can be accessed directly in Safari. This addition is so useful that the concept should probably be included in future versions of Safari for iOS but only time will tell if that happens. In the meantime here’s what you need to do to get this working. Save the bookmark change and load a new web page, tap on the + or – buttons to test font size changes live. Refreshing the page restores the font size to it’s default. This very handy solution comes from Marcos.Kirsch.com.mx, who recommends placing them in the Safari bookmarks bar for easy access. Make sure to tap on “see original” to copy the proper text, pastebin gets in the way. Oops, fixed with inline code blocks. Thanks for pointing that out. I hate pages that default to Times New Roman. So I adapted the + – bookmarklets to change the font to something more readable. I also created another bookmarklet to change only the font. By the way, it’s http://Marcos.Kirsch.com.mx not kirsh.com.mx [sic]. Sure thing! We typically like to walk through every step of a process so I included the boomarklet steps that you left out, thus the full walkthrough being placed here. The URL has been corrected, great tip BTW. Hey BBL, how did you get a black browser window? Maravilloso Marcos, thanks! I just test it in this article’s small font size, it works perfect. Now I can see this is what “tap translate” application do. I added the bookmarklet as they tell you in the application and is the same process. Marcos I’m visiting your page now! fukin dumbass apple, how hard is it to let us zoom and render on a safari page like android does? some pages are so small not even landscape and take care of..!!! sigh.. multibillion company.. SMH!!!!!!! Chester, I know this is an older post, but I recently ran into the same issue trying to make the bookmarks, and as replied to Joe’s post, the problem is the line number and space that gets copied with the script, and not the encoded characters… Safari will understand those characters, as long as you delete “1 ” from the front… Or “1%20” if already encoded. I have iOS 5 on my iPad 1 and when I try the bokkmarkelt scrip I get an “invald address” window. Any thoughts? Does not work on my ipad. The url input into the bookmark changes to something else once you close the edit. I can’t believ that the most profitable company in the world can’t build this into their iPad browser! Truly idiotic. In addition to giving the bookmark a longer name than – or + as mentioned by others, you can also quickly show favorites (book icon to the left of the safari destination field), and tap the bookmark there if this bookmark is created as a favorite. You can move it to the top of favorites by tapping “edit” in the bottom right of the favorites side bar, sliding it up on the lines symbol right of the title) and the favorites/bookmark/reading list sidebar texts on the iPad DO at least get larger when you increase your preferred iOS font size in settings > display+brightness. Here are some updated versions of these scripts. If page elements inherit sizes from a style sheet or specify sizes in % or ems (fairly common), the “+” script above may actually reduce the font size before it starts increasing it. The scripts below give more predictable and correct results in these cases. I also realized that often all I want is to increase the smallest text to a readable size (e.g., 20 px on my iPhone 4s in iOS 8.1), without changing the headings. So I added a script that just zips through and makes sure everything is at least 20 px. I called this “at least 20”. You can change the behavior of this script by changing the minSize setting at the start. I forgot to mention — on iOS 7 and 8 (at least for iPhone), Safari has no bookmarks bar, so you have to put these bookmarklets in your Favorites bookmark folder (or wherever). If you drag them to the top of the list of Favorites, it’s still fairly easy to use them. Safari remembers the last bookmarks folder you used, so you just have to tap the bookmarks icon and then tap the bookmark you want to use. Is there a way to add line spacing to go with this? On The New Yorker’s website it only increases the font size and you end up with text over top of each other. the reason for this message is a recent problem with Evernote’s bookmarklet. More and more, pages are detecting my iPhone and redirecting my browser to ‘mobile’ versions. There are obvious advantages to them but there are disadvantages as well. Some of the conent is usually stripped away. A more immediate disadvantage is the response if the Evernote app’s bookmarklet’s response. If a mobile page is up when the bookmarklet is used, the placard/card form that pops up is font size dependent. Almost always, the card is so large, only one quarter is visible. The card is not resizable or moveable. Do you have any suggestions I could use? I’ve already sent an email to Evernote with no response. Thank you @mfripp that was driving me crazy making the font smaller and slowly making it larger and larger and larger until it was finally larger than the original size. Is there anyway to increase the line heights at the same time? On the New Yorker for example, your script works but you end up with lines of text stacked on top of each other very close. Mfripp, please update your scripts! They do not work under iOS 8 on an iPad Mini 2! I tweaked the original + one in the article to this and got good results! Not being a programmer, I have no idea what I'm doing, but that helped in jumping quickly to a bigger font size rather than the tiny increases in the original script! That should do it! I just copied and pasted it in. It will make the jump to a larger size much quicker. Any way to do this in Chrome for iOS? Paul i thank you from the bottom of my heart for sharing this wonderful trick. I’m having IPhone 6S Plus. whats the use of 5.5 inch display if the font is too small? My earlier Samsung S4 with Opera browser was doing better. Even trusted browser Opera is not doing text reflow on iPhone 6S Plus. You have solved my big problem with this cute trick. Iphone 6S Plus Safari don’t have bookmarks menu. But no problem. I turn phone in landscape mode. 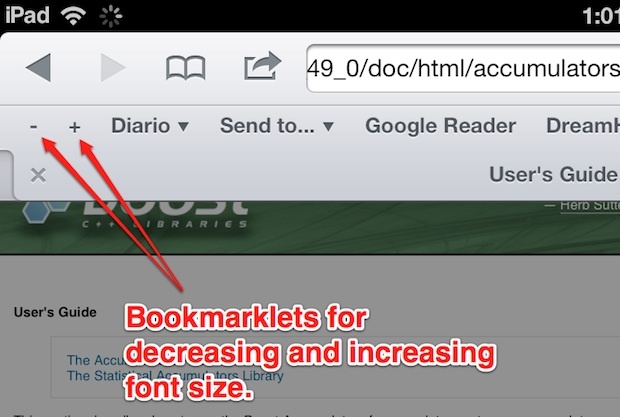 Access the book mark and quickly do test font resizing using + and – bookmarks. I can see text resizing while I tap + or – bookmarks. Marcos Kirsch cheers, got any code to in large the text in bigger steps? appericate this fix. Thank you! This works great on my iPad 12.9!